While I'm doing my best to patiently wait for the new Mrs. Magician album to be released, I've been keeping up on the various other projects that everyone has been involved in. Recently I've written about the Hideout LP, the Soaks cassette and now we're on to the new Jacob Turnbloom 7". 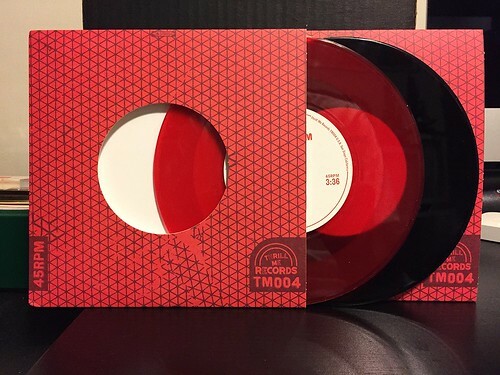 I picked up the limited to 100 red vinyl version as soon as it went on sale and then much to my surprise, Thrill Me sent a copy on black vinyl to me to review. It was pretty cool to see something I was anticipating so much show up for review and the fact that this is a damn good 7" only made it better. Right off the bat I'll point out that neither of these songs sound much like Mrs. Magician. Jacob Turnbloom really does a great job of making this solo work stand apart from the songs normally released by his main band. While I will certainly use Mrs. Magician as a frame of reference due to a few similar traits, don't expect a couple of songs that were just not quite good enough for the band, these are top notch. "Reborn Boys" is built off of a repeating synth lead coupled with big, loud guitars. There's none of the trademark Mrs. Magician reverb floating around on the guitars in this song, it's a fatter and much crunchier guitar tone. It's a fantastic, catchy song that is further elevated by Jacob's distinct vocals. A lot of bands can't pull off hitting those high notes, but they fit right in on this track. "Heartbreaker" is structured a little more closely to the way that a Mrs. Magician song may sound, but again the execution and sounds created end up sounding totally different and fresh. I actually like this song even better than the A-side. "Heartbreaker" starts off with bass & vocals and when that clean guitar kicks in, everything comes alive. Once again there's a little bit of 80's sounding synth providing the song with an additional layer of dynamics. Both songs are stellar. For me this was a must have 7" before I even listened to it, due to its connection with one of my very favorite bands. But unlike so many other records this year, Jacob Turnbloom managed to exceed my lofty expectations.